A trusted list of best executive recruiting firms comes in handy whenever you have an important senior-executive opening but lack the right search firm to fill it. The are plenty of lists out there, but it is hard to determine which one offers reliable information without a hidden bias. In “What Top Executive Search Firms Lists Can You Trust?”, we analyze and assess a number of the top executive search firm lists. In this post, we give you guidance on how to build your own list. Building your own search firm list has become a necessity, if not a “best practice”. That’s because the recruiting industry’s go-to resource The Directory of Executive of Professional and Executive Recruiters by Kennedy Information is no longer being published. In addition, it makes sense to build your own list. You know best what kind of search firm you need. To assist in that effort, we have a few suggestions. To find the top executive search firms, apply 3 filters: the basics, the values, and the competitive advantage. Most firms that specialize in your sector will pass the basic screening questions. The values filter will winnow that list down to a short list of possible top search firms to use The competitive advantage questions will inform your selection so that you can pick the right search firm that outperforms all the others. On the Internet, you’ll find checklists of screening questions to ask executive search firms to select the best ones. 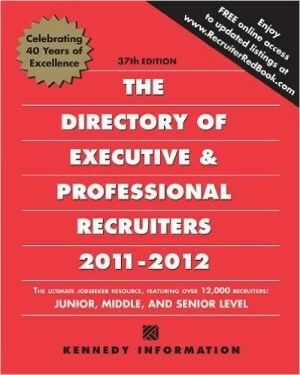 Does the executive search firm specialize in your industry or in the function of the position that needs to be filled? Check. Does the search firm have a good reputation and a strong track record of success? Check. Can the search firm recruit from your top target companies without any client blockage? Check. Does the search firm have the bandwidth to take on your search and fees you can afford? Check and check. Does your search firm have the capacity and geographical reach to handle our search? How so? Do you specialize in our industry and sector? How so? What client references can you provide? The only problem with the standard “what to look for in a search firm” checklist is that it still leaves you with a long list of search firms from which to choose. It does nothing to help you winnow down your list to the best choice. You do that by applying the next two filters. You deserve an executive search partner you can trust. While the retained search industry has long been a relationship-driven business, these days corporate search buyers need more than a golf buddy or tennis partner. You deserve an executive search firm that, in action and in word, demonstrates it is to be trusted. We recommended filtering for firms that have eliminated percentage fees and that share candidate information. Traditional search firms charge a percentage of candidate compensation, which sets up a conflict of interest. Percentage fees provide a financial incentive for the firm to inflate the compensation of the candidates that they recruit. Even though the Association of Executive Search Consultants has a Code of Professional Practice that states “AESC members avoid conflicts of interest with clients and candidates. Where a potential conflict may exist, members disclose and resolve those conflicts,” percentage fees remain an industry standard. Interestingly AESC changed the wording of that promise, which used to be called the Code of Conduct. It used to say, “AESC members will avoid, or resolve through disclosure and waiver, conflicts of interest”. Today’s code no longer promises to avoid conflicts of interest. However, there are firms that have eliminated that conflict and operate by flat fee. In addition to The Good Search, a handful of other firms charge flat fees including the global retained search Egon Zehnder. Traditional retained firm refuse to provide that candidate research, making it impossible to know what they have done or who they have contacted on your behalf. They often do so claiming that information the information confidential, which is not true. There is a great deal of information that is not confidential — the kind of information you’d find on a basic business card — that they could report out to enable you to audit their work. Does your search firm charge a standard percentage fee? If yes, why do you charge a percentage when that sets up such an obvious conflict of interest? What target companies are clients of yours from which you cannot recruit? Are you willing to put that in writing? As a practice, do you provide clients with all the candidate research with contact information so that we can audit your work? If not, why not? Last, there are questions about the firm’s unique value proposition. The firm must be different enough to offer you a competitive advantage. Search firms that conduct executive search the same way everyone else does — that have pretty much the same offerings and business model — lack the required ingredients for a competitive edge. When you use traditional executive search, you are using the same search firms and the same processes that your competitors use. Acting like your competitors is not how you gain the upper hand. Edge theory holds that change happens at the margins because it is free from the stifling orthodoxy of the center. In fact, experts have found that it is more efficient and more valuable to innovate from the edge than the center. While operating at the margins typically increases risk, in executive search it holds the potential to do just the opposite. Because 40% of retained search engagements fail to complete, the biggest risk may lie in doing search the same way that it has always been done for decades. The key to competitive advantage is filtering for executive search firms that search differently. Executive search requires a new kind of expertise to harness the power of data and to avoid becoming overwhelmed by it. If research is the execution engine of search, then data is the rocket fuel. A treasure trove of candidate data exists outside traditional recruiting resume databases and LinkedIn. That information can make search smarter, faster, better. Instead of uncalibrated candidates, data-driven search can start answering the question, “Who is good?” Moreover, data expertise is needed to wrangle the stunning amount of company, executive, and social network information to separate the signal from the noise. Increasingly, less qualified candidates are getting in the way of “the one” because you can’t see the forest for the trees. It is quite literally a problem of “too much information.” Other industries are investing in big data, data analytics, and more robust computer-assisted original research. A next-gen firm matches force with that trend. What does your firm do differently? What expertise do you offer that I won’t find at other firms? What person on your team has data research and analytics expertise? What have you done to make executive search process better? What, specifically, have you done to harness candidate information that doesn’t reside in traditional recruiting resources, databases, or on LinkedIn?